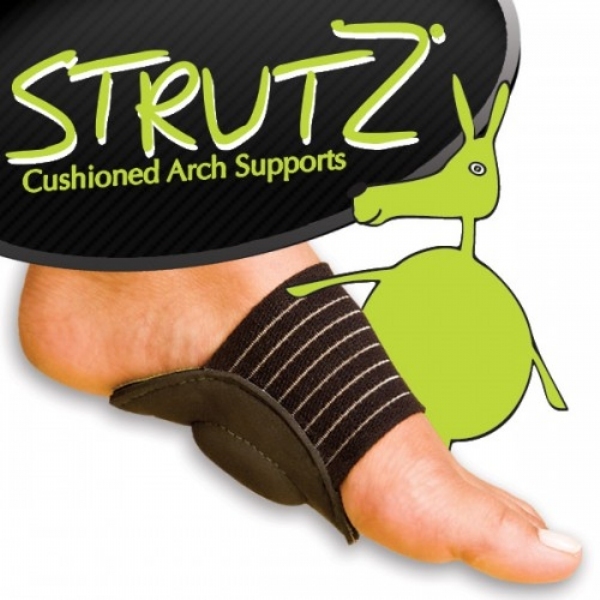 Strutz Cushioned Arch Supports, all day relief for achy feet. Strutz Cushioned Arch Supports, all day relief for achy feet. Strutz cushioned arch supports, as seen on tv, absorb shock with every step, while the comfortable compression band hugs your foot for maximum support and a perfect fit. Promotes good balance and body alignment. Wear with any shoe - even barefoot. Breathable polyester band with durable non-slip sole. One size fits all. Set of 2. Great for women and men. Buy Strutz Cushioned Arch Supports for all-day comfort and support! I have tried all sorts of arch supports for my work shoes and for the price these are very good! you can adjust them, they hand wash nice and they sure help relieve my aching feet after working a 12 hour shift. Try them you wont be disappointed. Bought first pair in drug store, loved them, it helps my knee pain. Looked everywhere for more but stores are out or discontinued. Went on-line, but VERY expensive. These arch supports are great!! I just wear under my socks all day. My feet don&apos;t hurt at all since I started wearing them. I&apos;m an Infant Teacher in a daycare center and can&apos;t wear shoes in my classroom. I would highly recommend them. These are great arch supports. They work well with slippers around the house. I wear them over socks, but they could be used on bare feet as well. The wide black strap prohibits use with "cute"shoes, but they would be great for wearing with boots or tie shoes. I am happy with the product and the price. Don&apos;t be fooled by sellers on other sites. These are the real things. I am flat fotted am walk on concrete all day long.I have spent alot of money on expensive inserts and lotions and bought lots of pairs of shoes.These have made my feet stop hurting. I had a bad accident. I have 5 herniated discs and I noticed improvement with these after I started wearing your product. I also have flat feet and these really helped with that. I paid many times the price of these for custom ones from Doctor that did not work. I am ordering more because these really work. Thanks so much. I could tell the difference in just one day of use! I&apos;ve been using them for a few days now and have had NO back pain! My wife got these for me as a Christmas Stocking stuffer. I was very skeptical. I have flat feet and have worn orthotics all my life for about 40 years. I started getting plantar fascitis 3 years ago and it was due to my arches getting weak when i was barefooted. My house has tile in key areas of the house and when i started wearing these, my arches quit hurting and I found I could stand for hours on both hardwood or tile with no issues. Surprisingly, my heels that would also hurt in the past, didn&apos;t as well which really didn&apos;t make sense to me since the heels are still in contact with the floor. So the plantar fiscitis had something to do with that also. I&apos;ve been wearing these for 7 months and am now getting a new pair. I wear mine every single day in the house from morning to evening and i spend a lot of time at home. I wear them in my flip flops too. One is still great shape. The other has a tear along the strap that could be repaired with stitching no problem The ball covering starting tearing away so that&apos;s why i&apos;m replacing and with no qualms in doing so. The price is cheap, and the product is amazing. I will always want to have a set for eternity for bare feet. Great when standing on concrete flooring all day. Best foot pain reliever ever used. Put on feet and can work in any shoes without having to buy insoles for each shoe. Last about a year for me while working as cashier at local grocery store. Eases back pain also. It helps my feet so well. I love it and would buy it over and over when I need more. I wear this around the house and use Dr Scholl&apos;s inserts for outside. Together they are helping me cope with fallen arches. Very good product. After podiatrist visits, new orthodics, ankle and foot brace, lots of ibuprofen, etc. these Strutz arch supports gave me instant relief from foot, arch and ankle pain. I use them for bare-footing around the house, or in slippers, as my walking shoes already have arch-supports. My feet are in rough shape and these help immensely. Though they fit my big, wide flat feet ok I can see why others are wishing they would come in larger sizes. Seriously, if you miss walking barefoot due to plantar fas, or flat feet, etc., give them a try. I use this product because I have arch issues. These make my feet feel great through out the day!